This beautiful bedroom has a king size bed and has been refurbished and freshly decorated throughout . The large bathroom is directly opposite (one step) and private to this bedroom - no other guests use it. There is a walk in shower and seperate bath, heated towel rail and complimentary toiletries. The bedroom has free Wi-Fi access, a work desk, a flat-screen TV with free view channels and DVD player, tea and coffee making facilities, alarm clock, hairdryer, bedside lights, conrollable heating and a fan for warmer nights. Guests have access to a fridge, microwave, and ironing facilities close to the room. Full English and or Continental Breakfast is always included in the price of this room. 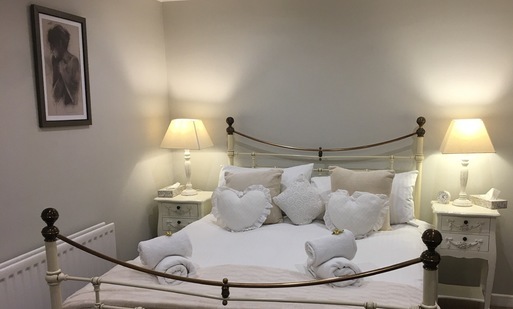 This spacious room , which has recently refurbished boasts a king size bed together with an ensuite bathroom with walk in shower, heated towel rail and compliemtary toiletries. 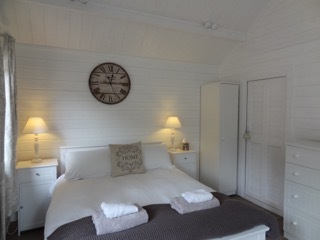 The bedroom has free wifi access, a flat screen TV with freeview channels, a DVD player, tea and coffee making facilities, alarm clock, hairdryer, bedside lights, controllable heating and a fan for warmer nights. Guests have access to a fridge, microwave and ironing facilities close by to the room. Full English Breakfast and or Continental Breakfast is always included in the price of this room. If it is a little more independance that you require, then our beautifully appointed Garden Lodge may be the answer. Set directly next to the B&B - so you can pop into the main house for your Breakfst in the mornings - the lodge boasts a double bedroom, bathroom with heated towel rail, galley kitchen (with washer/dryer, Fridge freezer , Microwave Oven/Grill (no hob), crockery and cutelry), Iron and Ironing board, tea and coffee making facilities, desk with stools . Free wifi and freeview TV. There is an excellent heater so don't worry about the cold on those winter nights - you will be warm as toast! All bedlinen, towels and complimentaty toiletries are included. You really are home from home. 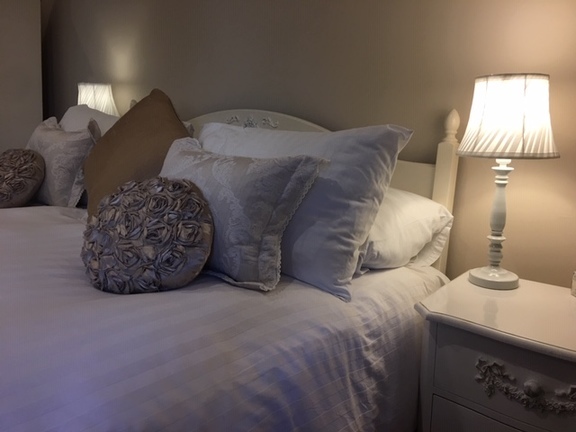 All rooms at Park Farm are comfortably furnished throughout with freshly laundered bed linen and towels. All our rooms have opening windows, controlled heating so you can be as warm or cool as you like and for those hot nights you will find a fan stored in the wardrobe. We provide complimentary tea and coffee making facilities and all rooms have hairdryers for your convenience and full length mirrors. The TV’s are flatscreen and have Freeview and DVD players. We provide free WFI and on request are happy for you to use our printer. 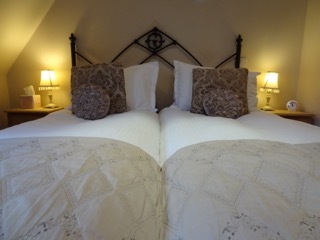 As a business traveller its useful to remember you will always be guaranteed a double bed – even when booking a single! The bathrooms are kept sparkling clean and have either heated towel rails or are centrally heated. Individual soaps, shower gels, shower caps and sewing kits are supplied. All you need to bring is your toothbrush and rubber ducks! Bedrooms and bathrooms are serviced daily. We have a fridge and microwave for guest use together with the use of an iron and ironing board. These are located so guests can access them as and when required – no need to ask.